You don't have to be a master craftsperson to make your own candle chandelier. In fact, with the right instructions and a little free time, you can make your own indoor or outdoor hanging candle display that will be the envy of your friends and neighbors. This fun project is both decorative and functional. 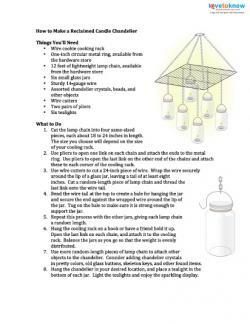 Print these instructions to make a candle chandelier. Cut the lamp chain into four same-sized pieces, each about 18 to 24 inches in length. The size you choose will depend on the size of your cooling rack. Use pliers to open one link on each chain and attach the ends to the metal ring. Use pliers to open the last link on the other end of the chains and attach these to each corner of the cooling rack. Use wire cutters to cut a 24-inch piece of wire. Wrap the wire securely around the lip of a glass jar, leaving a tail of at least eight inches. Cut a random-length piece of lamp chain and thread the last link onto the wire tail. Bend the wire tail at the top to create a bale for hanging the jar and secure the end against the wrapped wire around the lip of the jar. Tug on the bale to make sure it is strong enough to support the jar. Repeat this process with the other jars, giving each lamp chain a random length. Hang the cooling rack on a hook or have a friend hold it up. Open the last link on each chain, and attach it to the cooling rack. Balance the jars as you go so that the weight is evenly distributed. Use more random-length pieces of lamp chain to attach other objects to the chandelier. Consider adding chandelier crystals in pretty colors, old glass buttons, skeleton keys, and other found items. Hang the chandelier in your desired location, and place a tealight in the bottom of each jar. Light the tealights and enjoy the sparkling display. Wear protective eyewear and gloves when cutting and shaping wire. Make sure you use heat-proof glass jars. Canning jars are a good choice, since they are designed to be heat processed. Adjust the placement of the jars on the cooling rack while it's hanging. This avoids a lop-sided or slanting design. 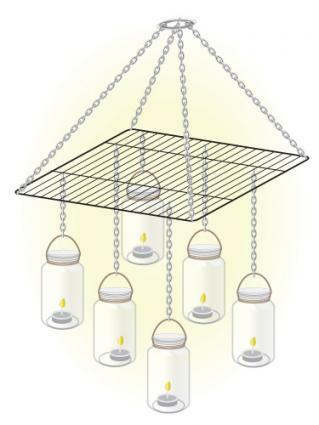 Consider using batter-operated tealights if you're using the chandelier inside or near flammable surfaces. Use spray paint, available at most hardware stores, to add some color to the metal portions of the chandelier. White is also a nice, fresh choice. Get creative with the found objects you choose for your fixture. Old silverware, glass bottles, and even Christmas ornaments can change up the look in a fun way. Don't feel like you have to stick to clear glass jars. You can choose a variety of colors, the classic blue of antique canning jars, or any other shade. Consider using mirror spray paint, available at craft stores, to give the jars a reflective mercury glass look. If you're feeling extra creative, add more jars to the top of the cooling rack using wire. This will give you a two-tier design. Making your own candle chandelier is a great way to express your creative side and also decorate your home in style. Because it uses found objects, your chandelier will be unique, just like the space you choose to display it.